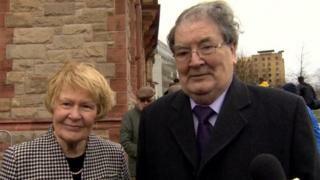 Pat Hume, the wife of former SDLP leader John Hume, is to be honoured with a lifetime achievement award by the Irish Red Cross. Mrs Hume worked alongside her husband from the beginning of the civil rights movement in the 1960s. Her work continued during the Troubles, right through to the Good Friday Agreement in 1998. Pat Hume ran operations on the ground, manning Mr Hume's Foyle constituency office. Mrs Hume met many young people caught up in the Troubles over the years and dealt with issues presented to her by thousands of people encountering housing problems, social security issues and health and education concerns. A spokesperson for the Irish Red Cross said: "John travelled for much of his political work and Pat was his eyes and ears on the ground, keeping him briefed on political matters. "This was all against a backdrop where the Hume family was often under threat. "The car was tampered with and the family home was firebombed and vandalised. These were threats Pat often dealt with alone while John was working away. "Given 2018 marks the 20th anniversary of the Good Friday Agreement, it is very fitting that as the year draws to a close, the Irish Red Cross is recognising the role Pat Hume played in Derry and her wider contribution to the politics which ultimately provided the basis for the Good Friday Agreement." Mrs Hume is now primary carer for John, who has been suffering with dementia for years. She will accept the award at the Irish Red Cross humanitarian awards ball in Dublin on 24 November. SDLP leader Colum Eastwood said Mrs Hume had given a "lifetime of service to the wider community of Derry". "As a party founded from the civil rights movement, Pat is indicative of everything it means to fight for equality and fairness for every person, despite class or creed," he said. "No-one is more deserving of this honour than Pat Hume and I am glad she is getting the recognition for all that she done for our peace process both yesterday and today."